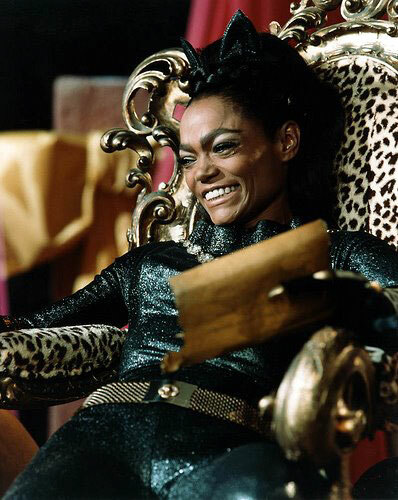 One could probably argue about who the best Catwoman was from now until the bats come home… but for me, the cutest contender has to be Eartha Kitt. Despite her purr-nicious propensity for puns, she was still the most active and engaging interviewee on the DVD for the 2004 Catwoman movie… meaning I’d much rather watch the Extra Features again, than the film itself. With the childhood nickname of Kitty, and her way with a rolling “R”, you could almost say she was born to play the part! It’s also worth noting that, in stark contrast to the top-heavy version currently jiggling her way through the comic books, Kitt had a far more suitable physique as far as gymnastic cat burglary goes. What I didn’t realise until this morning, when I picked up a CD compilation at Woolworth’s, is that Kitt is also an accomplished (and multi-lingual!) singer, with three Tony nominations and two Grammy nominations to her credit. Despite being known for jaunty tunes like “Santa Baby”, her own early childhood would provide ample fodder for a Blues career… but, much like the author of the album’s liner notes, and its somewhat sketchy and rose-tinted biography, it is not my place to rake over all of that. No, that’s what Wikipedia is for! 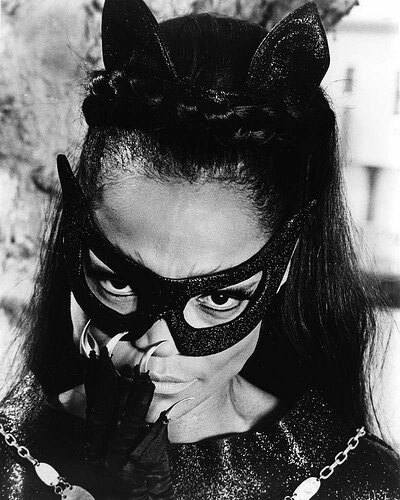 Speaking of which, let’s crib shamelessly from their article for some of Kitt’s career highlights: Kitt got her start as a member of the Katherine Dunham Company and made her film debut with them in Casbah (1948)… Kitt’s unique style was enhanced as she became fluent in the French language during her years performing in Europe. She dabbled in other languages as well, which she demonstrates with finesse in many of the live recordings of her cabaret performances… In 1950, Orson Welles gave her her first starring role, as Helen of Troy in his staging of Dr. Faustus… A few years later, she was cast in the revue New Faces of 1952… In 1954, 20th Century-Fox filmed a version of the revue simply titled New Faces. In 1958, Kitt made her feature film debut opposite Sidney Poitier in The Mark of the Hawk. Throughout the rest of the 1950s and early 1960s, Kitt would work on and off in film, television and on nightclub stages. In the late 1960s television series Batman, she played Catwoman in succession to Julie Newmar. In 1968 her career hit a bit of a snag, however, when Kitt made anti-war statements during a White House luncheon. “It was reported that she made First Lady Bird Johnson cry. The public reaction was much more extreme, both for and against her statements.” According to her entry at IMDb, Kitts’ comment ran along the lines of, “I am a mother and I know the feeling of having a baby come out of my gut. I have a baby and then you send him off to war. No wonder the kids rebel and take pot.” I can’t argue with that. A biographical essay hosted by the University of South Carolina website states: “She was blackballed and was unable to find work in the U.S., with the exception of a few talk shows. Contracts were lost or cancelled. The CIA developed a file containing personal and professional information. Eartha moved to Europe, where she lived and worked for the next ten years, struggling financially and ignored by many friends. Kitt has said she would have spoken out even if she had known the consequences.” She was later welcomed back by President Jimmy Carter, and has been hard at work ever since, recently picking up an Emmy for her voice-over work on Disney’s cartoon series The Emperor’s New School. In addition to her work as a performer, Kitt is also a successful author of three autobiographies, and has been a spokesperson on behalf of abused children for UNICEF. This entry was posted in Rants about Music, Rants about TV and tagged Batman, Casbah, Catwoman, Dr. Faustus, Eartha Kitt, Helen of Troy, Jimmy Carter, New Faces, Sidney Poitier, The Emperor's New School, The Mark of the Hawk. Bookmark the permalink.